Set within the historic clock tower across from Madison Square Park, The New York EDITION evokes the intimacy of a private home. The 273 unique rooms and suites feature oak floors and and oversize windows, offering outstanding views of Madison Square Park, the Empire State Building and the city skyline. The Clocktower, led by Michelin-starred Chef Jason Atherton, embodies the hotel's elegance while offering all day dining for those who enjoy high-quality, seasonally inspired food and drink in a unique setting. Rejuvenate yourself on the 39th floor at the exclusive urban spa, or at the fitness center. 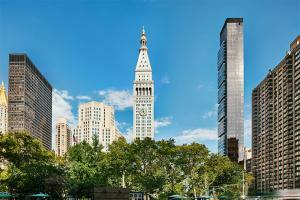 Set in the Flatiron District, across from Madison Square Park, and 9-miles from LaGuardia Airport. Empire State Building, Times Square, Central Park, Chelsea Piers, and The Highline are all less than two miles from the hotel.